Are you missing teeth? There are many problems associated with missing teeth, and it is important that you talk with an experienced cosmetic dentist to learn more about the treatments that can be done to restore your smile. Dental implants are gaining in popularity, and it is easy to see why many people are choosing the dental implants procedure instead of other types of dental restorations. Even though there are different methods for tooth restoration, implants are considered one of the best options since the implants act in the same way as your natural teeth. Once a dental implant is in place, it allows you to enjoy the appearance of a beautiful, natural smile. Additionally, you will be able to talk, eat, and participate in your daily life activities without worrying about missing teeth or dentures. 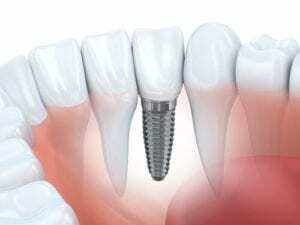 Implants maintain the normal function of your mouth, as if the original teeth were still in place. The dental implants procedure requires several visits and multiple months to complete, but patients agree that it is worth the effort because of the final outcome. When a tooth is missing, an implant post can be placed within the jawbone, which will then assimilate the post to strengthen the jawbone and hold the new tooth in place. Typically, the implant is placed, then then the patient must wait for three to six months before the procedure can be finished. Once it has been determined that the implant is strong enough to support a crown, the new tooth is placed on top of the implant and it acts in the same way as a natural tooth. Teeth implants cost more than traditional dentures and other dental restoration treatments, but they are worth the cost because of the long-term benefits that are available from this procedure. Implants are designed to offer long lasting results, allowing you to enjoy the similarity of having natural teeth in your mouth. If the implant is done right and you are careful about dental care and cleaning, it is possible that the implant might last for the rest of your life. For more information about the benefits of dental implants, we invite you to schedule a consultation with our team here at Millennium Dental.